Reigning Turkish Airlines Euroleague champion Olympiacos Piraeus will head to London to defend its crown after knocking out Anadolu Efes Istanbul with an 82-72 victory Fridat at Peace and Friendship Stadium in the fifth and final game of their exciting playoff series. 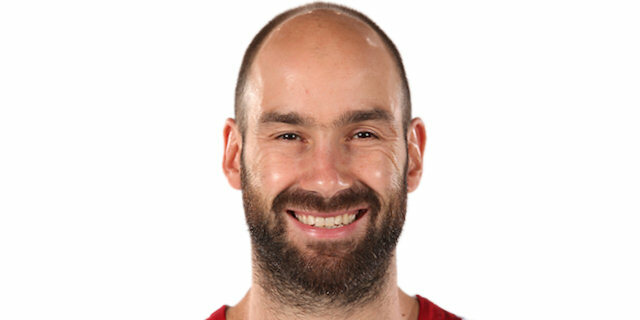 2012 Final Four MVP Vassilis Spanoulis led the champs with 19 points and 5 assists as Olympiacos rallied from a 15-point second-quarter deficit to win the game and series. Spanoulis’s layup with four minutes left game his team the lead for good, 68-67, and started a 16-5 charge to finish the game. In London, Olympiacos will face CSKA Moscow in the semifinals in a rematch of their thrilling championship game from last season. 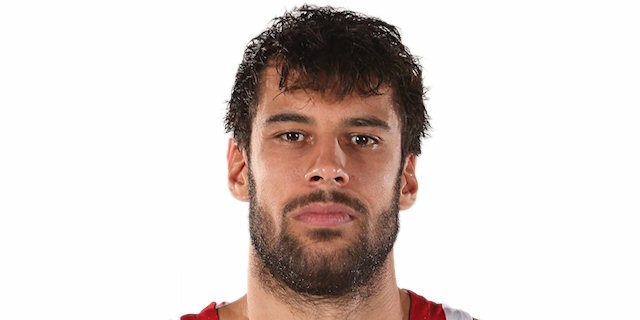 Georgios Printezis added 15 points and 7 rebounds as Olympiacos got points from 11 different players. Jamon Lucas led Efes with 14 points and 5 assists, Dusko Savanovic added 12 points and Jordan Farmar 11 in the loss. Kerem Tunceri made a three-pointer and dished assists – and Farmar and Sinan Gular also connected from deep – in a 0-13 blitz to open the second quarter that put Efes ahead 21-36. Olympiacos closed the gap to 8 by halftime, tied the game and took the lead in the third quarter and set the stage for an exciting finish. The lead changed hands three times in the last 10 minutes, but the closing minutes all belonged to Olympiacos, which can continue to dream of a repeat. Efes went inside to Semih Erden for two of its first three baskets. 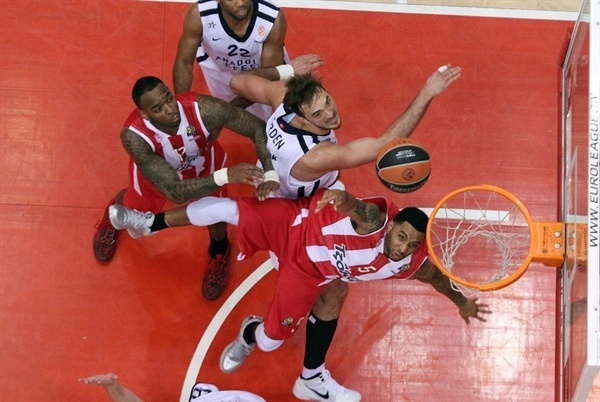 In between Spanoulis put the hosts ahead briefly with a triple. Erden committed his second foul just three minutes into the game as Kostas Papanikolaou scored and was fouled to make it 7-6. However Farmar and Savanovic answered to push the visitors ahead by 4. Spanoulis’s next basket was matched by Erden, who took a pass from Savanovic and threw down a two-handed slam to make it 11-15 midway through the quarter. Lucas further extended the Efes lead with a jumper. 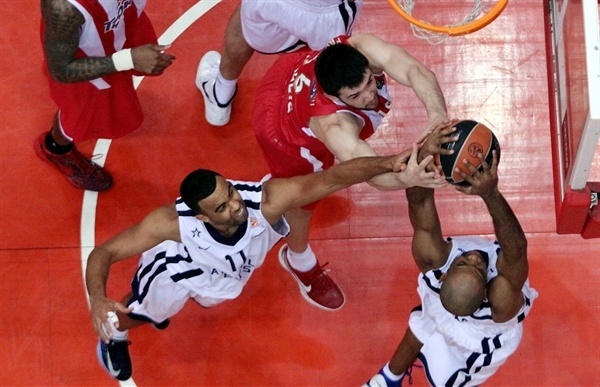 The Reds kept pace behind free throws by Printezis, Spanoulis and Dimitris Katsivelis. Lucas fed Farmar on the break for a layup and Guler scored with an impressive spin move in the paint. Josh Powell beat the buzzer with a long jumper to bring his team within 21-23 after 10 minutes. Efes kept its confidence into the second quarter. 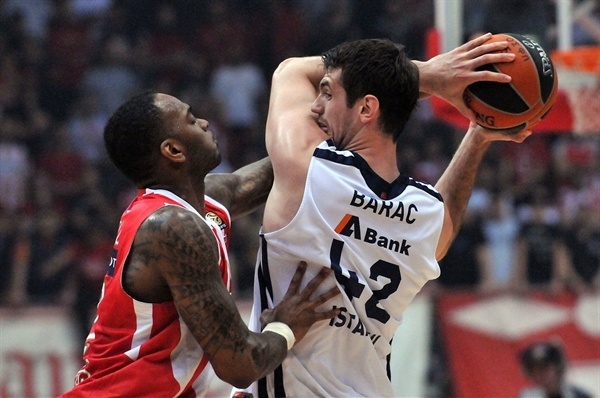 Stanko Barac scored inside, Farmar added a layup and Guler connected from behind the arc, while on defense the visitors held Olympiacos scoreless for nearly five minutes. A Farmar triple sparked an Olympiacos timeout, but even after that Tunceri knocked down a triple to completed a 0-13 run and put his team up 21-36. Printezis finally ended the Reds’ drought, but Farmar raced down court and scored seconds later. Stratos Perperoglou and Kyle Hines each scored their first points to rejuvenate the hosts. 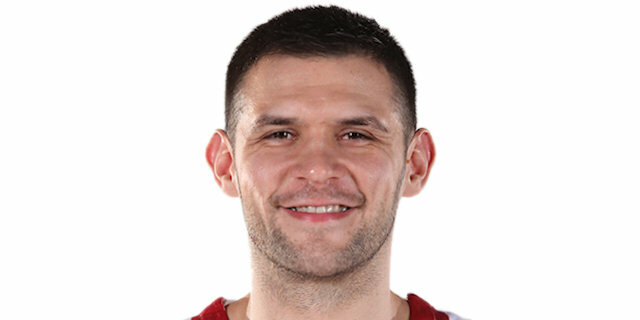 Even though the Olympiacos attack remained stalled, the Reds stepped up on defense and a Kostas Papanikolaou three made it 30-40. A second Papanikolaou triple closed the gap to 33-41 at halftime and gave the hosts – and their fans – hope for the second half. Game 4 hero Lucas scored a tip in a minute into the seconds half, temporarily restoring a double-digit lead. Powell countered for the hosts, but Lucas and Savanovic put Efes back up by 12. Powell started becoming a force with a second-chance basket. 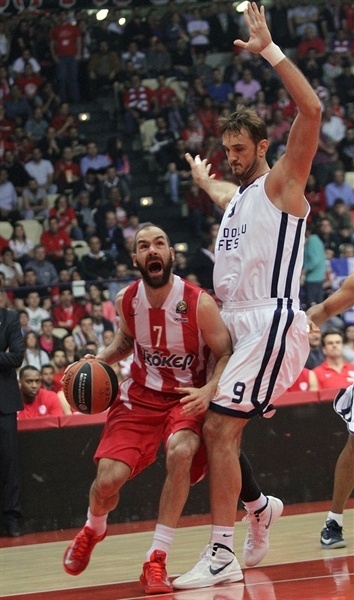 A pair of Spanoulis baskets closed the difference to 41-47 and got the Peace and Friendship Stadium rocking. A Guler layup was matched by a Powell jumper. Kostas Sloukas drained a three to make it a one-possession game… and Spanoulis followed with a game tying-triple, 49-49. Erden split free throws to put Efes ahead, but Printezis made sure it didn’t last. The forward collected a Sloukas miss, put it in and drew Erden’s third foul. Guler carved through the Olympiacos defense to tie the score with a layup. The lead continued to flip flop until Kerem Gonlum free throws pushed Efes ahead 54-55 at the end of the third quarter. The hosts looked to assert themselves at the start of the fourth quarter. Pero Antic buried a three, Acie Law penetrated for a layup and Perperoglou followed with a long jumper to make it 61-55, prompting an urgent Efes timeout. Josh Shipp banked in a tough shot for Efes, but Law matched him. After Savanovic scored inside, Perperoglou connected from downtown. Seeingly down and out, Efes roared back. A fast break Shipp slam over Hines silenced the crowd before Tunceri capped a 0-8 run with a triple to put the visitors up 66-67. Savanovic took a seat with 5 fouls and Spanoulis went inside for a layup that put the Reds back on top. Printezis added a triple and suddenly Piraeus was loud again. Printezis’s trademark baseline floater made it 73-68 before Hines rose to block Lucas. Free throw woes for Efes – Gonlum, Shipp and Erden combined for 3 of 6 – kept the visitors from getting too close. Instead Law drained a three from the corner with 1:24 to go to make it 76-70. Printezis split free throws with 54 seconds remaining, Olympiacos got the rebound and Spanoulis iced the victory from the line with 41 seconds left. "I can’t describe my feeling right now. I am extremely happy and proud for the club, for my players, for the owners and for the fans. 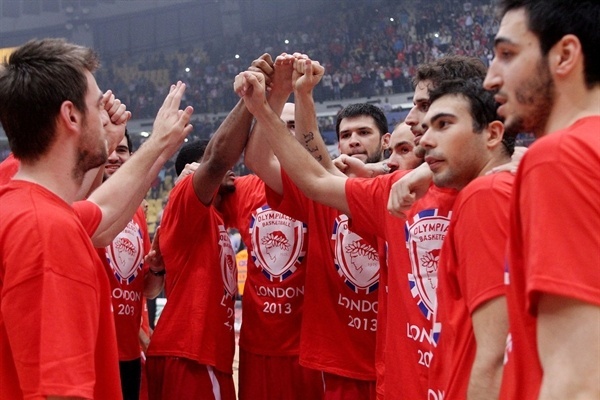 Olympiacos will be there for a fourth time in five years and this is a really big deal. 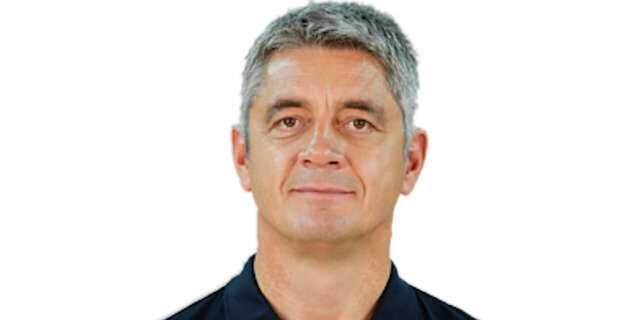 We have a body based on Greek players and this is a something that makes us optimistic for the future. Tonight we played in a game with several changes of situations and sentiments. Anadolu Efes won the last two games and came here without pressure. They decided once again to give us some open shots, but we had very bad percentages in the first half. Then we showed our character and that was the key to get the win and the Final Four berth. From our side, we had to show once again patience and perseverance. I think that we are a better team than they are and after all there is a very sweet flavor for the whole team. The must-win situation is the biggest obstacle for any team, but we used it as an extra motivation. Everybody was aiming to beat the reigning Euroleague champions and this put us under extra pressure all season long." " We proved tonight that the Euroleague trophy we won last season was not a lucky one. Olympiacos makes it to the Final Four for the fourth time in five seasons and I feel proud to belong to such a basketball powerhouse. Tonight we suffered a lot, but we came back and this is business as usual for this team. We are a good team and aiming to repeat." "Definitely is a great day for the club and myself. The game was tough and Anadolu Efes caused us a lot of problems, but at the end we managed to get the win and make it to the Final Four. We will travel to London for the best possible result, playing hard, smart, with good defense and effective offense." 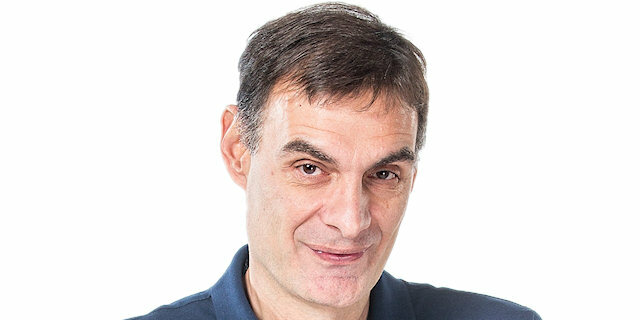 "It is always very difficult for any reigning Euroleague champion to make back-to-back Final Four appearances. The season was too tough and long, that’s why all the teams had to deal with the ups and downs. We didn’t start well both in defense and offense, but we found the path to the victory. Now we are going to London to play our basketball. We are the defending Euroleague champions and we will do everything possible to be successful there. We have to play freely, with heart, good tactics and, hopefully, with some luck. " "This is a great season. I think that this is a huge success that doesn’t happen very often for a reigning Euroleague champion. We corrected our mistakes during the game and played with heart, passion and great will. For the upcoming Final Four, impossible is nothing! It is very difficult to repeat it, but we will try to do the best. I feel very happy and proud as a player of this outstanding team."